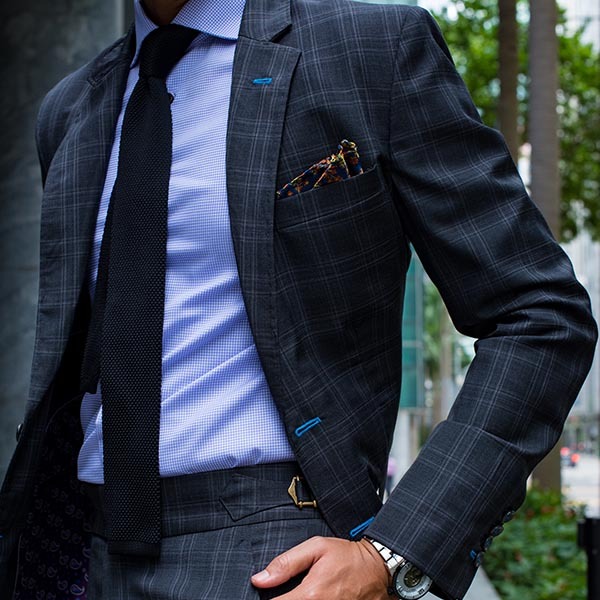 There are three pillars to a well made custom or bespoke suit. If you are looking for an exquisite custom made suit then we invite you to our Boutique studio to view our curated collection with extraordinary craftsmanship. We are in the business of making men look good and feel confident. Established in 2014, we are one of the very few bespoke tailoring houses in Singapore with a fully owned production unit. From Pattern Making, Cutting to Sewing and Packing, everything is under our control. Fused Canvas Construction by default. Basted Bespoke Suit in a Light Brown Herringbone Super 110s wool Notch Lapel Jacket with a high Gorge Point. Tailored Grey Suit using a Super 120s broadcloth wool fabric customized with hand made buttonholes, pick stitches, lapel hole and linings from Huddersfield. Our basic suits are constructed with a fusible canvas. These custom suits are perfect for gentlemen on a budget and for repeated wear regularly. The suit can be further customized to include designs, linings, monograms and much more. Our premium suits are constructed with full horse hair canvas handstitched on the lapel, chest piece and the collars. Premium cloth includes fabrics from mills such as Vitale Barberis Canonico, Drago, Piacenza, Marzotto, Holland & Sherry and Ermenegildo Zegna. This is the process that makes a bespoke suit truly so. It all starts with the measurement, posture analysis and the first draft of a pattern. We use paper patterns for the first draft. Our first fitting involves a Muslin fit that is loosely constructed with one sleeve to check the fit. Shoulder slopes, Armhole depths, collar to neck distance and other important aspects like padding structure etc are taken note of and a revision to the pattern is done. The actual cloth is now cut and a Basted fit is brought in to analyze the fit one more time. Minor adjustments if needed are marked and the garment is now sent back for completion. During delivery a Final Fit test is conducted to ensure that your custom or bespoke suit is nothing less than spectacular. The pattern is revised one final time and saved. We digitize the pattern and save it in CAD. Next time when you order with us we can skip the Muslin fit and start with the Basted fit instead. Please do note that in order to keep prices affordable we use the Basted fit only on our Premium collection of fabrics. READY TO PLEASE THE MAN IN THE MIRROR?